This 34.5mm. 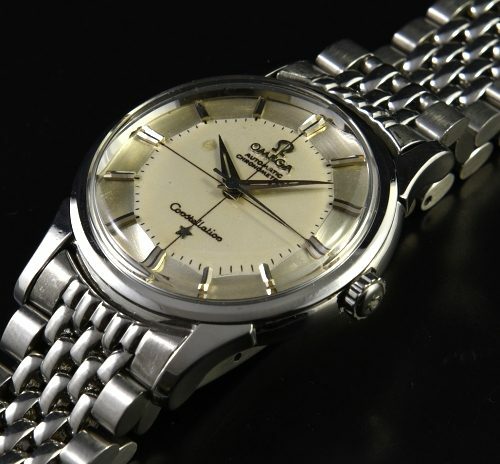 OMEGA CONSTELLATION dates to 1960 and has a completely original pie-pan dial and handset having a fine vintage patina. The 7.25″ OMEGA beads of rice bracelet displays very clean condition. The OMEGA winding crown was replaced at some time over the years. The solid gold observatory emblem is quite crisp for its age. The automatic chronometer grade movement was just cleaned-accurate. I love how the print on this dial has aged and the font has “bled” making it more bold and thicker. original Connie dials are getting harder to find these days.